Experience the music of three of Catholic music’s most influential composers as they sing about their faith in the one God. "In every age, the Church has called upon creative artists to give new voice to praise and prayer. Throughout history, God has continued to breathe forth his creative Spirit, making noble the work of musicians' hearts and hands. The forms of expression have been many and varied." Inspired by each other's music and their common approach to ministry, these three generations of Catholic songwriters embarked on the Age to Age: Generations of Faith concert tour, to join whole communities in spiritual renewal. Bring the experience of these events into your daily life with this unique and varied collection of anthems. From beloved titles you know by heart—including covers from each composer—to fresh arrangements of future classics such as "Many and One," "Ready the Way" and "These Alone Are Enough"—uniting all three artists in song—Age to Age highlights the enduring themes of faith, hope and love through a sung tapestry of prayer. Leaving behind their categories of youth, liturgical and contemporary, Steve Angrisano, Dan Schutte and Curtis Stephan come together to share their music with one another and with the Church... three powerful voices, one powerful faith. 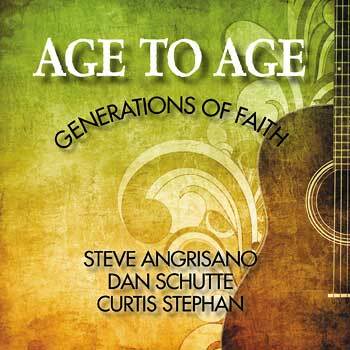 This is the MP3 playlist for Age to Age: Generations of Faith, by Steve Angrisano, Dan Schutte and Curtis Stephan. Leaving behind their categories of youth, liturgical and contemporary, Steve, Dan and Curtis come together to share their music with one another and with the Church... three powerful voices, one powerful faith. Inspired by each other's music and their common approach to ministry, these three generations of Catholic songwriters embarked on the Age to Age: Generations of Faith concert tour as a means to join whole communities in spiritual renewal. Bring the experience of these events into your daily life with this unique and varied collection of anthems. From beloved titles you know by heart—including covers from each composer—to fresh arrangements of future classics, this collection includes such songs as "Many and One," "Ready the Way" and "These Alone Are Enough." Uniting all three artists in song, Age to Age highlights the enduring themes of faith, hope and love through a sung tapestry of prayer.